Dinosaurs have been brought back to life as a weekly newspaper continues its pioneering use of technology. 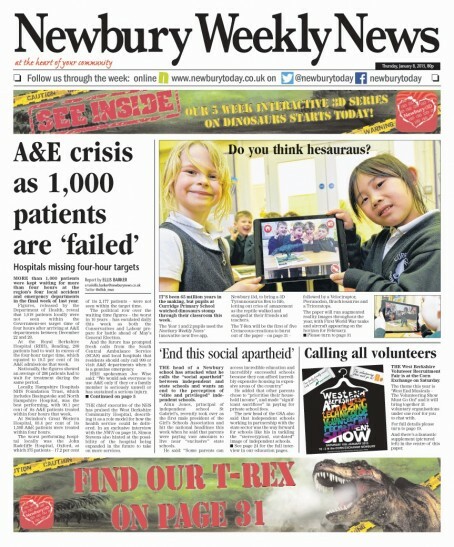 The Newbury Weekly News, in Berkshire, has launched an augmented reality 3D application through its print publication, which allows readers to create a 3D image of a dinosaur by hovering their phone over the page. Readers download the free Newburyi3D app to their device which they then aim at the page, bringing the image to life. They can then take photos of the resulting picture. The Weekly News was thought to be the first newspaper in the country to implement the technology when it experimented with a 3D Father Christmas feature last month. The app has been created working alongside fellow independent groups Kent Messenger and Tindle Newspapers. This week readers were able to create a virtual Tyrannosaurus Rex, which will be followed by different dinosaurs during the rest of January. Next month the paper will feature First World War planes and tanks. Newbury Weekly News editor Andy Murrill said: “We hope our augmented reality 3D images will thrill our current readers and also inspire a new generation to enjoy their local newspaper. “We are encouraged and enthused by the large number of people who have already downloaded our app and this is sure to grow as the weeks go by. “This is a great example of using digital technology to add great value to local newspapers and bringing real excitement to our readers. Echoes of early cinema when audiences used to duck out of the way of trains heading towards the camera. Who knows what the people of Newbury will make of electricity, television, aeroplanes and other mod cons when they finally reach them. Dinosaurs? Do you mean editors and sub editors? Endangered species. Great fun… maybe we could have 3D news pics as well. hope they can sell a few more papers on the back of it. Only at the paper’s price rise and low story count! Three Dimension Reject. Been looking at some old papers at my under-staffed weekly. Story count just swamps the present total, and all local. What a con it all is now! Dinosaurs, anyone over 40 in the world of journalism. Try getting an interview at the age of 56, with 35 years experience. Full marks for trying an idea which might flog a few more copies of the printed paper….some of those obsessed with on line at the expensie of the traditional paper should take note! Shame about the typo in the dinosaur headline which just makes it look inexplicably German and will have been spotted and ridiculed by every reader over the age of 5. Otherwise, a rare and not unwelcome example of a new medium complementing, rather than urinating on the smouldering remains of, an old one. Typo does look awful for professionals. Or is it some “in” joke? Thought this was a story about newspapers in Cumbria when I saw dinosaurs. Or anywhere for that matter.